Peel potatoes and kohlrabi and cut into small pieces. Cook in salted boiling water for approx. 15 min. or until tender. Wash and dry trout and season with salt and pepper. In a bowl mix some milk and salt. Add flour to a plate. First put trout into the milk, then coat completely on both sides with flour, shaking off the excess. Add vegetable oil to a frying pan set over medium-high heat. Fry trout on both sides for approx. 10 min. or until cooked through. Melt half of the butter in a pot and sauté almonds in butter until golden brown. Drain the potato and kohlrabi and mash with remaining milk and butter until smooth. Season with salt, pepper, and nutmeg to taste. 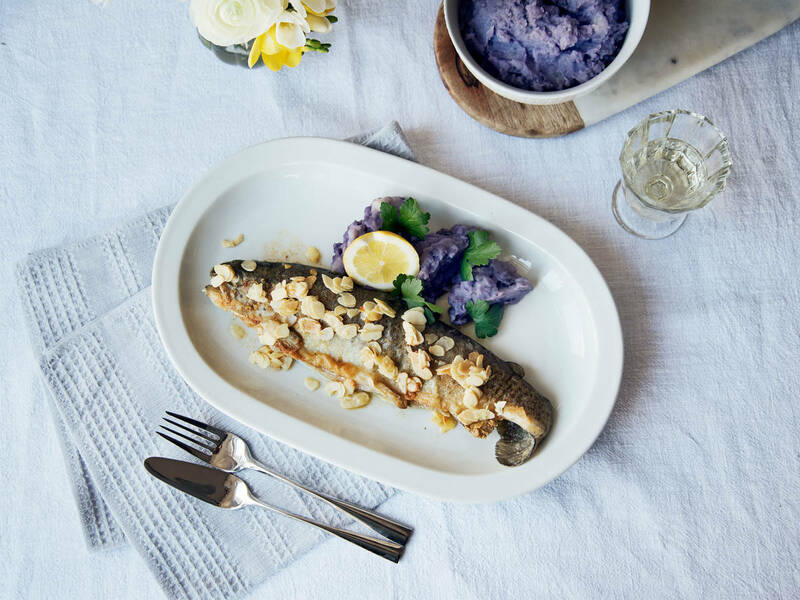 Serve trout on a plate and drizzle with almond butter. Serve with potato purée and a lemon wedge and enjoy!